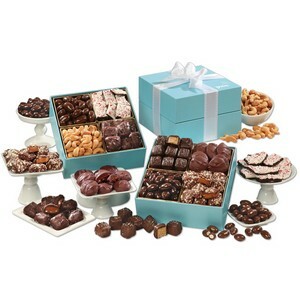 Here's a great gift for an entire office or large family because there's so much to sample and share! This elegant gift contains a supreme assortment of our favorite gourmet confections, including Chocolate Peanut Butter Meltaways, our signature English Butter Toffee, Chocolate Covered Almonds and more. Your logo is foil-stamped in white on the top box. This one is guaranteed to bring a smile to the face of every lucky recipient! 8 Peanut Butter Meltaways, 1/4 lb., 12 Pieces of English Butter Toffee, 5 oz., 12 Pecan Turtles, 6 oz., 8 Chocolate Sea Salt Caramels, 4.75 oz., Peppermint Bark, 5 oz., Extra Fancy Jumbo Cashews, 5 oz., Milk Chocolate Covered Almonds, 5 oz., Dark Chocolate Covered Almonds, 5 oz. Price includes imprint foil-stamped in white on top box.